Bake salmon fillet according to package directions. Combine butter and flour to make a roux. Cook for 6-8 minutes over medium heat. Add leeks and cook for 5 minutes. Add cream, chicken base, American cheese, wine, water, salt and pepper and cook for approximately 10- 15 minutes until thickened and creamy. Let the sauce cool slightly, pour the sauce into a blender or food processor and blend in the red peppers and Tabasco. Heat 1-2 tbsp. of olive oil in a large sauté pan. Add the vegetables and cook for 3-4 minutes over medium high heat. Add the cooked, drained pasta and sauce to the pan. Cook until items are well blended – 2-3 minutes. Cut the salmon into bite size pieces and add to the pasta & vegetables. Cook for 1-2 minutes until heated through. 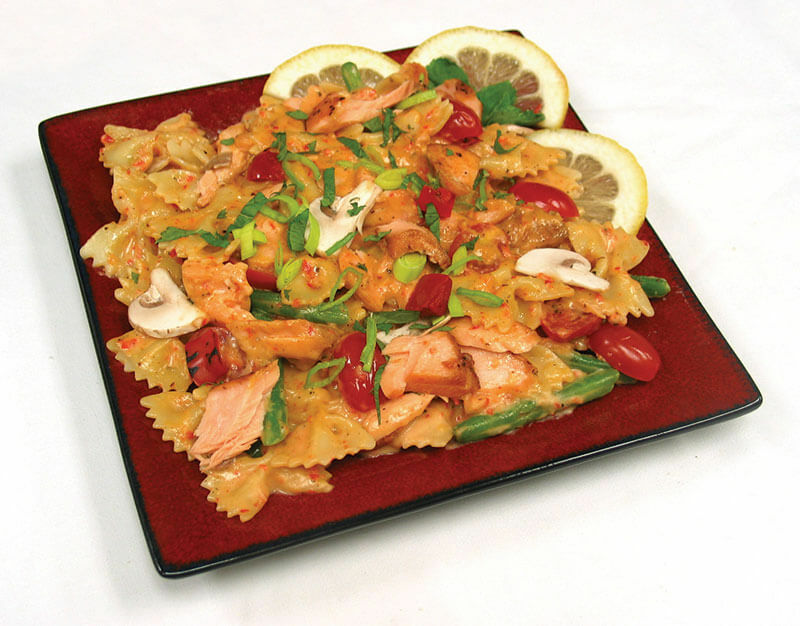 Pour salmon and pasta on to a serving platter, garnish with chopped cilantro and serve.